Welcome and thank you for your interest in The Cheshire Set Flyball Team! If you like the fast and furious, having fun with your dog and a tennis ball, then flyball is the sport for you! We train outdoors on Saturday mornings, or occasionally Sunday mornings. Times vary and will be advised each week. Our venue is the Knutsford Sports Club on Mereheath Lane, WA16 6SZ. We park around the left-hand end of the building. If the weather looks bad, please check emails before setting out as we don't train in really wet weather. For newcomers, we offer a free trial session, to see whether you and your dog might enjoy the sport. If you decide to give it a go we charge £30 to join in with 6 training sessions. The weeks don't need to be consecutive, though it is helpful for new dogs to come as often as possible. You and your dog will not be training for the whole session, usually for around 15-20 mins at a time on different skills. You may be asked to put your dog in the car for a rest in between, please say if this will be a problem. You can reward the dog with treats or a favourite toy. If you are rewarding with treats, please bring something soft and small that you dog can easily and quickly eat. If you have a dog harness it may help but is not necessary. If you wish to purchase a dog harness look for one that does not restrict leg movements, ill-fitting harnesses can impede your dog’s comfort, speed and confidence. You will need to wear something comfortable and suitable for the weather, you will often be running/moving around but then will be standing waiting or playing off to the side with your dog, so layers are best and something suitable for your feet. In the warmer weather you and your dog will need shade, water and rests and maybe even suntan lotion! You can purchase cooling coats for dogs which are mainly used at competitions and covers for cars – remember cars can become ovens very quickly. Please be aware that not all dogs are friendly or want another dog running up to them in their face so please keep your dog focused on you and on a lead unless it’s your turn to train. After your six sessions, we hope you will have enjoyed yourselves enough to join the team. Our subs are currently £15 a month. There is no further fee to pay no matter how many (or few) training mornings you attend. The only other costs would occur further down the line if you wanted to enter a competition. You will also be given a personal password enabling you to access the “members only” protected pages on our website which give regularly updated team-related information. Your details will be added to a mailing list, you will get an email on Thursday or Friday with details about training on it as training can alter due to the weather and team competitions and other factors. Please respond to the email by Friday evening to let us know if you can attend or not so we have an idea of numbers. You can purchase team t-shirt, fleece, hoodie and jacket with our logo on if you wish but it’s not a necessity. We hope you and your dog have lots of fun. These games are about building confidence for you and your dog. Collar/Harness grab – to help with sending and retrieving your dog. With your dog’s favourite treats, simply start by touching the collar/harness – as you do, deliver a treat and praise. If your dog doesn’t like treats use your voice to deliver lots of praise or a favourite toy. Work up to holding the collar/harness and, while still holding the collar/harness, deliver lots of treats/praise. You can also use a tug toy to play this game if your dog LOVES the tug toy. Restraint recall – to get your dog excited about returning to you. A helper will hold your dog by using the harness or putting one arm around his/her chest and the other under his/her belly, or both hands on the dog’s shoulders. Take a few steps away (only as far as your dog will be confident). Call your dog’s name, run and when he is close reward with toy, lots of praise, teats when he/she gets to you. For those of you who cannot run away, you need to develop an exciting posture that gives the perception of running away. Lean forward while pumping your arms fast and walking or even standing still. One of the most important cues to speed is bending forward. Just leaning forward and away from the dog after you call will cue speed – when doing this make sure you are as upright as possible prior to calling the dog (the change from upright to leaning forward is a great cue). Game can progress to dogs running in opposite directions with netting in between, then dogs running together same direction back to their owners. Collecting a stationary ball – to get your dog excited about a non-moving ball. Hold your dog and throw the ball out in front. Once the ball has stopped ask your dog to get it. Reward your dog when they come back with toy, praise, treats. Build up the distance you throw the ball, once mastered you can run in the opposite direction when the dog reaches the ball shouting their name getting them to drive to you for tuggy/treat. This can progress onto another person placing a ball on the floor and shouting your dog, you release your dog to get the ball and return to you with lots of praise, toy, treat. Advance distance and run in the opposite direction creating drive. This will resemble the flyball lane but without the box or jumps, your dog will collect a stationary ball and drive back to you. Can progress onto 2 dogs running in opposite directions past each other and then running alongside each other with netting in between then without netting. Teaching jumps – introducing jumps in a fun way. Using one jump encourage your dog over it and treat with toy, reward, praise. You can add netting/wings getting them used to netting as well. Progressing onto introducing a stationary ball and adding in more jumps. Word Association – getting your dog used to words and phrases in everyday situations. While you are out walking you can introduce flyball words, so if they jump over a log/fence/wall you can say “OVER”. When you let your dog go after a static or moving ball – while holding them say “READY, READY, READY” to encourage them to get ready, you can say “WHERE’S THE BALL?” to get them focused, then as soon as you release them say “GO”, “AWAY” or “GO GET YOUR BALLY”. This can transfer into flyball with the jumps and seeing the ball in the box because when they hear these words, they will start to look for something to jump and the ball. This particularly helps with focus when wings and netting are removed. You can use this method for various activities, but consistency is key. The key to training your dog to play with you and your toy is that you are SINCERELY interested in playing along as well! If you are truly not having fun, your dog will quickly realize this and will be even more reluctant to join in. So be sure that you are both enjoying yourselves. Creating excitement using a tuggy can be used in flyball for faster returns to you, as your dog moves their attention from the ball to you with a toy, that they really want to come to you and play with. Not all dogs or owners like to tug and that’s fine. Some dogs return just as quickly to more balls, treats, praise, another toy or even just to line up and have another go. But we can’t use squeaky toys as this is classed as a distraction to other dogs racing. Toy Options: creating tug drive often involves coming up with unique toys for your dog to tug on. Think about what your dog LOVES to have in his mouth… a study of your dog and his desires, find safe and fun interactive items to use to create a love of tugging. Your tug toy needs to be interactive between the two of you, we suggest soft or toys on a rope. You may choose to tie a light line to any of the above toys to help make it move and squiggle along the ground to make it “entice” as prey to your dog. Try to mimic a dog when you tug, start by getting low and squiggling your toy on the ground. Allow the dog to grab and hold. Let him create the resistance versus you pulling it away from him. This is good for many reasons but mainly while the dog learns to trust that the play is genuine. A way to make tugging safer is to use toys that are attached to a bungee. Bungee tug toys give and take with every tug and they are friendly to your joints and your dog’s neck. There is no need for you to spin, stir, shake, whip or bounce the dog around on the end of your toy when you are tugging. When dogs tug with other dogs you will never see one bounce the other up and down. If you shake a dog up and down on a toy you are hyper-extending that dog’s neck a little with each shake. Our dogs’ necks are built to have tremendous power from side to side, but not up and down. If you are going to move the tug during your tug sessions with your dogs do it gently from side to side rather than “snapping” or jerking the dog abruptly. Tugging is a great way to warm up your dog before exercise get them turning in both directions and stretching as well as warming up muscles and excitement. If your dog responds to treats as a reward, it’s a great way to let them know they have done well. Avoid feeding your dog a large meal just before training as your dog will be less motivated to work for you if he/she is full. Some dogs work better on an empty stomach although some find it more difficult to focus if they are very hungry – if this is the case, you may find your dog works better after a light meal. You will need to reward you dog for correct behaviour with something he/she enjoys and is motivated to work for. You will need to bring something that you know your dog REALLY likes and lots of it, a “High Value” reward and maybe only use it for flyball. Things like cheese in chunks or in a tube, cooked chicken/ham/turkey/sausages, dried sausage, crab sticks, hotdog or liver are popular. Whatever the treat, pieces should be small enough for your dog to eat quickly – larger crunchier treats take longer to eat and will interrupt the flow of your training. Standard bought dog treats are fine as long as they are soft and you can easily break off smaller pieces. Also think about what you are storing/carrying your treats in, when you run and move about with your dog you don’t want them falling all over the floor, you also need easy access to them. But please be careful that you only pass the treat from your hand to your dog’s mouth – many dogs find other peoples’ dropped treats more interesting than the training they are supposed to be focused on! Be aware of how many treats your dog is getting and adjust their evening meal accordingly to avoid putting on weight. Also, be aware of sugar and salt content with treats or any dietary needs your dog may have. Some dogs will work better for other rewards like toys or tuggies rather than treats, you will need to find what is best for you and your dog. Before any intense physical activity, it is important to warm up your dog to avoid any injury. · Start by trotting them around. · Get your dog twisting and turning, moving from side to side to warm up the joints and muscles. You can do this by using a tuggy or throw a ball slightly to the side of their head for them to catch so they step to the right and the left. It’s just as important to teach your dog how to unwind and rest, you won’t be training with your dog for the full training session and if you attend any competitions there will be waiting time where your dog will be required to rest. It’s good practice to get your dog to settle in your car or a covered crate. Placing them in a secure and comfortable environment away from stimulation will allow them to recharge and be at their best for when they come out again. You can provide calming toys like licki mats, cream cheese or peanut butter in a kong to help settle them, their dog bed, cuddly toy or blankets may also help. If your dog is not comfortable in the car, try a crate that they can rest in with a large blanket to cover it which could be set up out of the car. In hot sunny weather, it is vital that owners are vigilant about their dogs’ welfare. A car can quickly become an oven even with the windows open and dogs can die of heat stroke. Cool coats or cool mats can be used to keep your dog at a comfortable temperature, and at competitions paddling pools are provided which many dogs enjoy wallowing in. In between races try to find a nice patch of shade to sit in while awaiting your next turn. Think about the times at which your dog will be racing, and try to arrange their feeding accordingly so that they have time to properly digest the food prior to racing. Especially during down time, it isn’t advisable to feed your dog big amounts of food as they won’t have time to digest it before they run again. Ensure your dog has access to water and adequate ventilation. While your dog is resting you can always get involved in helping to train the other team dogs, we always need ball collectors or box loaders or have a chat with other members. The above picture is a 2-week-old puppy. You can see why they are so wobbly when they're young. None of their bones are fused together. This can take up to 18 months to fuse together. 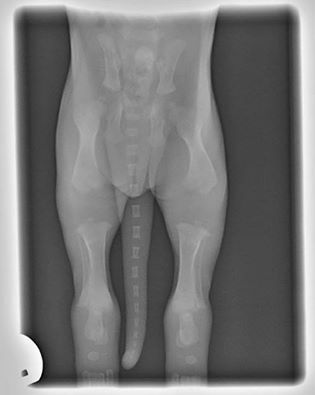 The growth plates are soft areas that sit at the ends of the long bones, they contain rapidly dividing cells that allow bones to become longer until the end of puberty. Until the growth plates close, they are soft and vulnerable to injury. After sexual maturity the growth plates calcify and the rapid cell division ends. Intense exercise, or even long periods of gentle exercise in young dogs can contribute to arthritis in later life. Under 6 months old: no jumps, just run backs to owners on the flat. To progress other puppies could be used as a distraction. Older experienced dogs should only be used if no young dogs are available. Running the same way to start with, then in opposite directions. 6 to 8 months: learning to fetch balls from a standing start and starting to watch which way they turn, as dogs are naturally right- or left-pawed. No jumps but with jump wings or netting to run though getting them used to netting. 8 to 10 months: start to introduce the jumps, run backs only and no more than 6 part or full runs for each dog. 10 to 12 months: allow fetching the ball off the floor over all the jumps but again limited runs, then the dog must have a break (down time) before doing any more. At 12 months and over we begin chute training but again not a long session to begin with as dogs can easily get bored! Want to be more involved? Here’s some ideas of how you can help. Don’t be afraid to ask if you are unsure. · Let us know if you can make it or not. If your dog is unwell or has been in contact with kennel cough please keep them away and seek advice. · Setting up equipment and putting away equipment. · Holding dogs for run backs. · Setting the jumps to the correct height for the dogs running. · Putting jump wings in and out as needed. · Making sure box loader has enough balls, normal/squishy/coloured. · Doing the line, timing full runs or individual dogs, and watching change overs. · Putting a jump in and out in front of the box as required. · Ensuring any socialising isn’t distracting/in the way of dogs running. · If your dog isn’t running that they are on lead or far enough away and not likely to interfere with dogs running. · Ensuring you are ready if it’s your turn with your dog, making it more time efficient and smoother running. · If you take equipment to practice with at home, please bring it back the next week. · Cleaning tennis balls and bringing back the next week. Competitions we attend: Only BFA/UKFL members can enter the flyball ring at competitions unless it is a race for starter dogs. · All of the above plus possible dog holding outside the ring to allow us to swap dogs. · Writing down dog times and team times on the running sheets. · Lifting box in and out of the ring. · Assisting with warm up times to ensure the lane is ready and we are ready to race. · If we have apprentice dogs using the 2’ warm up time for experience they may need help, putting wings and a training jump in at the box and ensuring that these are removed when the team is ready to race. · Ring party duties – box judge, scribing, lights. When we host competitions there will be lots more ways to get involved in as we set up gazebos, lanes, make drinks, do lots more paperwork, run raffles, fill water bowls, prepare rosettes for the presentation and ensure the smooth running of the competition.